Can't get enough delicious Pearson Ranch California Orange Blossom Honey out of the 12 ounce jar or 10 pound pail? 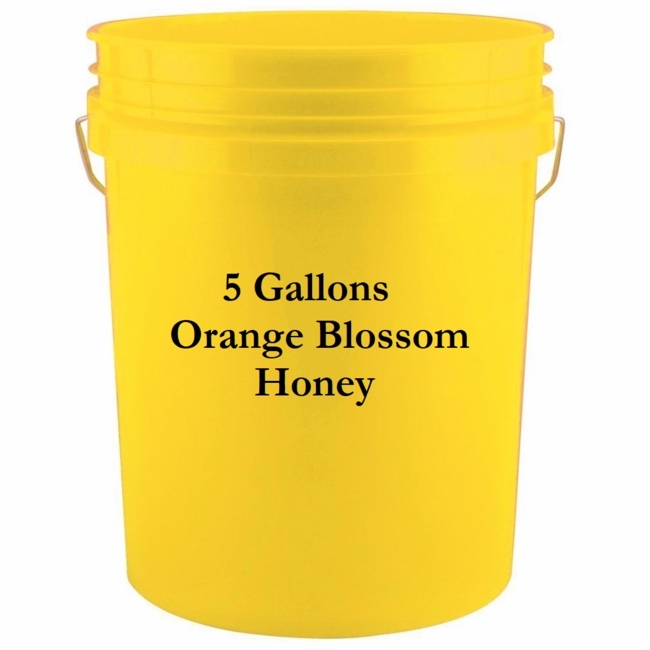 Try buying orange blossom honey in the new convenient 5 gallon bucket! That's right, get your own bucket of the wonderfully raw, unfiltered, and all natural orange blossom honey you LOVE. Whether you need 5 gallon bulk honey for food service use, a large public event, gifts, or for food storage preparedness, Pearson Ranch has it, 5 gallons of California orange blossom honey! So start baking those homemade muffins or cornbread and brewing up your favorite tea, and let Pearson Ranch "SWEETEN" your day with pure orange blossom honey. Now you can buy truly the best Orange Honey online!...Orange Honey, nature's perfect food. As soon as the orange blossoms open in the San Joaquin Valley's "Orange Belt", the bees go to work to create the most delicious and delicately scented honey you can find anywhere! And not only is Pearson Ranch Orange Blossom Honey all natural, it makes a great sugar substitute for most cooking and baking needs. Upon opening your container of Pearson Ranch Orange Honey... you will be able to detect the fine and delicate scent of orange blossoms. Your first taste of our all-natural golden honey will fill your senses with the aroma and the sweetness of springtime orange blossoms in bloom. Orange honey truly is one of the greatest gifts from Mother Nature, her bees, and the San Joaquin Valley. Orange Honey is always wonderful in hot teas, and is absolutely delicious in a vinaigrette salad dressing. Orange Honey also adds just the right touch of sweetness in your morning hot cereal, and is excellent when used to make a "glaze" for roasted pork or poultry. After you try Orange Honey from Pearson Ranch, and experience all its healthful benefits such as containing antioxidants, as well as being both Fat Free and Cholesterol Free and discover all the ways you can use it in your kitchen...you'll see why some call it "nature's perfect food". Orange Honey 101...Did you know? Pearson Ranch grows, packs and ships the very best California Navel Oranges and California Valencia Oranges, and Specialty Citrus, in the world. Sweet and juicy navel oranges and valencia oranges are just a click away from Pearson Ranch, California. Custom or Special and Corporate Orders are Always welcome. Call us at 1-888-O-ORANGE (1-888-667-2643) to order by phone. And never forget, Everything Pearson Ranch sells comes with a 100% customer satisfaction guarantee!